We are living in a great age of exploration. Over the last decade or so, we've discovered thousands of planets orbiting other stars in our galaxy. These "exoplanets" are too far away to actually see, even with our most impressive telescopes. Instead, we detect them when they pass between their parent star and Earth, dimming the star's light at regular intervals. These passes are called "transits". Now, however, astronomers have turned this concept on its head in a new study, asking which of these alien worlds might be able to spot Earth and the rest of our solar system in the same way. The first counterintuitive thing that they found is that it might actually be easier to see the smaller planets of the solar system than its enormous gas giants. ”Larger planets would naturally block out more light as they pass in front of their star”, said lead author Robert Wells, a PhD student at Queen’s University Belfast. The second is that only a maximum of three planets could be ever detected at once, and even then not from everywhere outside the solar system. 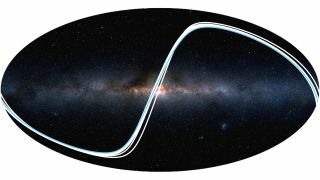 ”We estimate that a randomly positioned observer would have roughly a 1 in 40 chance of observing at least one planet," said Katja Poppenhaeger, a co-author on the study. By narrowing down the list in this way, the team ascertained that only 68 of the thousands of exoplanets we've identified would be able to see one or more of the planets in our solar system. Only nine of those would be ideally placed to observe transits of Earth. And here's the kicker - none of those are thought to be inhabitable. But! The team estimates that there should be approximately ten currently undiscovered worlds which are both favorably located to detect Earth and capable of sustaining life. Which means ten chances that an alien civilisation at the same technology level that we're at would know that our planet even exists. The team's next plan? Target those transit zones to search for exoplanets. And maybe identify the home of our first interstellar buddies along the way. The full study was published in the Monthly Notices of the Royal Astronomical Society.